The Personal Protective Equipment at Work Regulations 1992 require many factors to be taken into account to ensure that the correct clothing is chosen for a particular task. Is it suitable for the risk? Choice of clothing should take into account ambient and artificial lighting conditions at the workplace, and the effect of conditions such as fog and snow. For some jobs an HV waistcoat, for example, may be all that is needed, but those workers who are particularly at risk, eg from moving vehicles (marshallers or maintenance workers), may need full body HV clothing so that they are as visible as possible to the driver. HV clothing should provide adequate protection both during the day and at night, as well as in adverse weather. As a rule: the darker the conditions or worksite, the greater the amount of HV clothing required. To be effective HV clothing should be of a colour that will allow the wearer to stand out against the ambient background found in the working environment. In practice the best colours for this purpose are likely to be day-glo, or fluorescent yellow. Where necessary the clothing should also incorporate retroreflective material to make the wearer visible when seen in headlights in poor lighting conditions or during darkness. 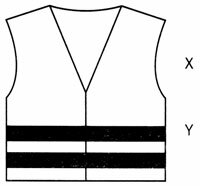 This may require reflective strips at or below waist level on waistcoats or jackets, or strips on trousers. Is it suitable for the job? People working in warehouses may find that some types of loose fitting tabard may snag on moving machinery parts. Also HV coats may be too warm in summer months, in which case, waistcoats or overalls with the appropriate HV qualities could be supplied. Remember: PPE must always be suitable for the work; if the way of working changes - check that the PPE is still suitable. Is it suitable for the wearer? HV clothing should be comfortable and fit the wearer properly. It should cause the minimum of restriction in the wearers movement. Is it compatible with other forms of PPE? If two or more types of PPE are worn, they should not interfere with each other. Therefore, in the case of aircraft servicing staff for example, protective clothing for chemical spills should also provide the necessary level of conspicuity. Similarly, wet or cold weather clothing should have suitable HV qualities or be capable of being worn under HV garments. Are there any standards which the clothing should meet? The first number (X) indicates the class of conspicuity, this depends on the minimum area of conspicuous materials that are incorporated into the clothing, with Class 3 being the best and Class 1 the lowest; the second number (Y) indicates the retroreflection performance with Class 2 being more visible than Class 1 when seen in headlights during darkness. The standard gives specifications for coveralls, jackets, waistcoats, tabards, trousers and harnesses. From July 1995, new clothing must be 'CE' marked to show it meets the new European rules on the manufacture of PPE. Remember: the CE mark only means that the clothing meets the standard. It does not mean it can be used in all situations. HV clothing must be suitable for the actual conditions of use. supervise employees to ensure that they wear the clothing correctly and whenever it is needed. Employees should wear the HV clothing provided as instructed by your employer. Look after clothing issued to you, check for and report any damage or defects to your employer. Use the storage facilities provided when the clothing is not in use. Remember: damaged or ill-fitting clothing will not protect you properly.